Results of 63 Knots at the Rock. 15' to 20' seas. Here's how you can save a little money by doing the Purchase and Sale Agreement and the re-documentation yourself . . . assuming you have no broker, bank, or other mortgage interest involved. 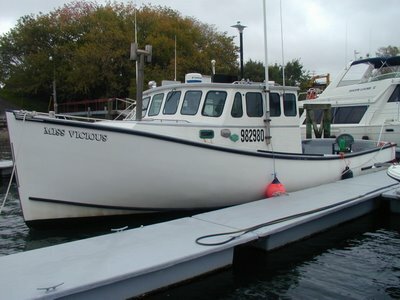 First, get the Name and/or Official number of the vessel and get the Official Document info on line. Next, take this info and use it to fill in the blanks in a standard Yacht Purchase Agreement. You can find one of these online by doing a Google search for "Yacht Purchase Agreement." Pick one that comes in a PDF Format so you can fill in the blanks on your computer. 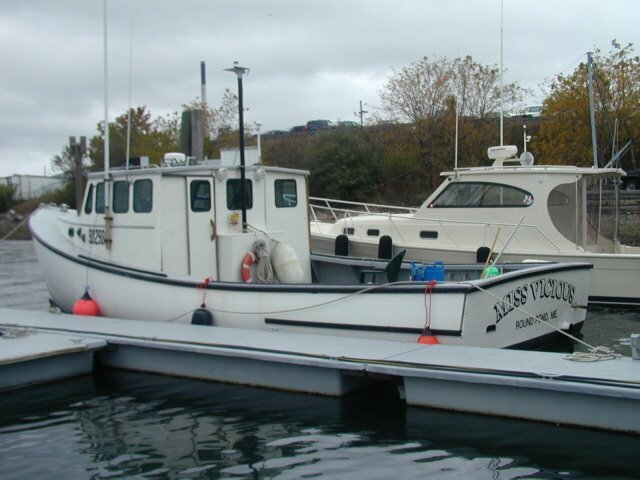 Include names of purchaser(s) and seller(s), addresses, purchase price, boat name and official number, description of vessel, and attach a list of the equipment that comes with the boat, right down to galley utensils if there are any. No SS#s are needed here. Also list the contingencies of the sale, i.e. survey, financing, sea trial, etc. Remember, with these online PDF files you can't save the document, so print out as many copies as you want. There should be one for you and the seller, and one for each and every buyer and/or seller, in the event there are multiple buyers and sellers. Each copy should be signed and dated by both parties, and each one notarized. Again, make sure you have all the agreed on conditions of sale, e.g. 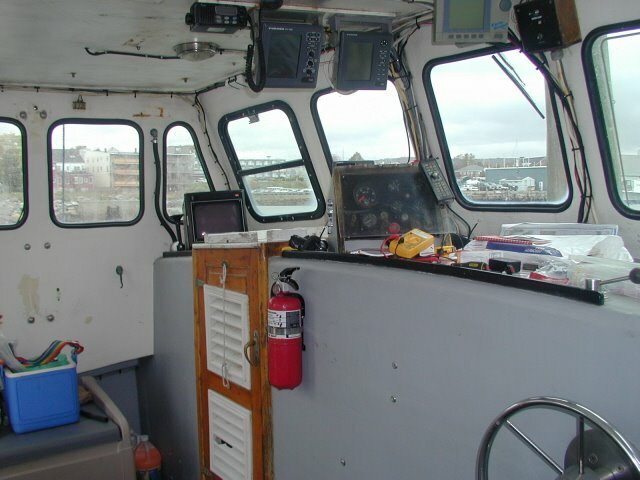 survey, loan, sea trial, things to be fixed, etc. Now go to the USCG National Vessel Documentation Home Page and download the appropriate forms, first and foremost of which is the request form that will tell you what if any liens there are on the boat. This is the Abstract of Title request. Send this in first. You should have results in a few days. If there are any outstanding liens (preferred mortgages on the boat, these will have to be satisfied or released before a new document can be issued. Applications for Satisfaction of Mortgage, and forms for filing of mortgages, are also available on line at the link above. For re-documentation, you need a notarized Bill of Sale, a Satisfaction/Release of Mortgage statement for each mortgage (signed and notarized by a bank official), an application for Filing of Mortgage (if in fact you're financing with a mortgage company or assuming someone else's mortgage), and the current Certificate of Documentation signed over to you. All these blank forms are available at the NVDC Site listed above. One final note: The procedure for documenting a new vessel is slightly different. You have to prove ownership and citizenship, which means you will need a builder's certificate and Form 1258, where you can provide your social security or tax I.D. number. Every day Moonfish gets a little closer to being ready for sea. 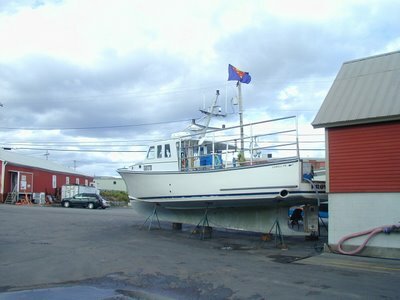 I've re-run and rerouted wire, moved electronics, bolted the electronics console in place, replaced worn hose, checked and replaced hydraulic lines, added chafing gear where needed, clamped and wire-tied loose hose and wire, removed wire that went nowhere, tightened the engine belt, built a platform at the helm, checked and replaced engine zincs, replaced rudder zincs, waterproofed some of the windows and hatches, fixed broken fittings, tightened loose screws and bolts, and generally attended to things the previous owner would have done himself had he kept the boat. For the record, it costs $121.00 to do your own paperwork. This includes an Abstract of Title and the application for redocumentation. A service would charge $300 to $400. I had the paper work done in about a half hour, although I ended up making an unscheduled trip to a bank in order to track down a second satisfaction of mortgage I didn't know about. Took about an hour an a half of my time. Start to finish, I had the the new document in my hand in a week. The guys at the Documentation Center in Virginia work pretty fast. 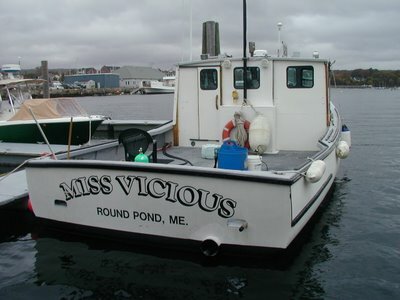 I needed a marine surveyor for the insurance company. I've had some bad experiences in the past with surveyors, but this guy was OK. In fact, I knew him years ago when he was with the USCG Marine Safety Office. 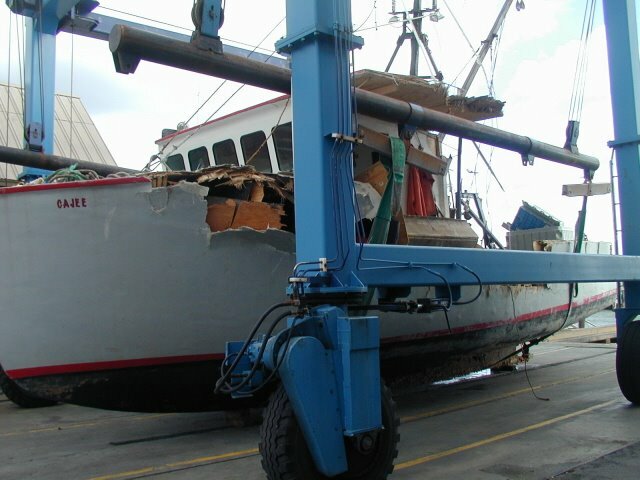 He was one of the inspectors who would visit Finback twice annually for her hull and safety inspection. Surveyor was Mike Whitten, of Bucksport, Maine. Take my word for it. If you must have the boat surveyed, for either an insurance company or a bank, make sure the person doing the survey knows what the hell they're doing. At $15 a foot, you want to feel like you're getting something more than just a chance to shell out a fortune in insurance premiums. I can't say the money I spent on the survey would not have been better spent on a new EPIRB, which I have to buy anyway, but at least I had a chance to review the boat's systems and condition with someone I respected. Would I have voluntarily chosen to have to boat surveyed had it not been required by the insurance agent? Not on your life. The only thing left for me to do to be completely legal is to have the new name put on. Both bows and stern. This is kind of a conundrum because I have some gelcoat work to do on the transom, right under where the lettering will go. It's a Catch-22. I need the lettering and name so I can be official and legal and get to work, but if I put the lettering on before I fix the gelcoat, I'll just have to re-do the name afterwards. Oh, well, not much I can do about it.